I wrote this handy little utility after getting fed up with the rather limited PLAY and SOUND command in Oric BASIC. It allows one to set up a bank of register values, send them to the AY and Save/Load them from Disk (16 bytes). It took about an hour to write but will prove very useful to me and perhaps others. It requires Sedoric to run since it uses Sedorics USER command to call the ROM routine passing X and Y parameters (address of sound bank). 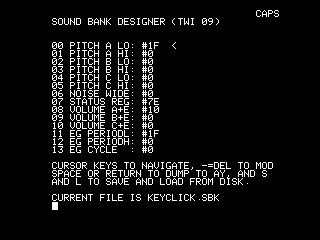 The utility is called SDES (Sound bank DESigner) and looks like this..
As you'll see all instructions on screen. and the tap is below..
From the Oric bible (AUG) the following Oric sounds can be made using this utility. Just enter the bank data for each below..
For a more detailed explanation of the registers available please refer to the sound section of the defence-force wiki.. This is awesome .. you've basically opened up the AY chip for full-synthesis .. cooooool! just place the following towards the start of your program. And then treat #BFE0 - #BFED as the AY registers. Everytime you want to make the change.. The ROM routine sits at $FA86 and if passed the address in X and Y registers will dump 14 bytes from the address to the AY registers. hmm, i wonder if i can tell you how to do it without being at home..
CLOAD the program, and enter these lines.. Remove the line or text..
Now save the program and it should (fingers crossed) work! And just for information the actual mc was.. Some interesting rythms can be had by mixing eg repeting sawtooth or triangle with chip channels as the following example demonstrates nicely. This should work on both emu and real oric in same way but difficult to know for sure without trying it. Because it's easier for me to deal with int rather than hex I modded Twi's basic program to display int and added the ranges of the values to be used (according to "L'Oric à Nu"). For the details of bytes 7 and 13 then it's better to have a look at the book or read Ladywasky's explanation in english on this forum or in french on oric.org's forum. I added a LPRINT option for those who would like to copy and paste the values they've been playing with instead of saving them on the sedoric disk. You'll find attached the modded DSK, if it's a problem for the moderators, just erase it from my message. Thanks. I'll have a look later.